Gears of Halo - Video game reviews, news and cosplay : Bioshock Infinite: Cloud City but without Darth Vader? Bioshock Infinite: Cloud City but without Darth Vader? It’s a ways a ways from release but the third Bioshock game known as Bioshock: Infinite is promising to be a most interesting prospect for the 2021 gaming release calendar. 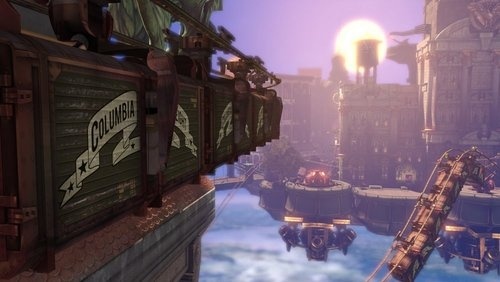 The third game in the popular Bioshock series, BioShock: Infinite breaks away from the underwater setting of the first two games to take players into a floating city held aloft by dirigibles. The official synopsis is thus: Former Pinkerton agent Booker DeWitt has been sent to rescue Elizabeth, a young woman imprisoned in Columbia since childhood. Booker develops a relationship with Elizabeth, augmenting his abilities with hers so the pair may escape from a city that is literally falling from the sky. DeWitt must learn to fight foes in high-speed Sky-Line battles, engage in combat both indoors and amongst the clouds, and harness the power of dozens of new weapons and abilities. DeWitt was ejected from the notorious Pinkerton National Detective Agency for his extreme methods–methods that may serve him well in the unpredictable city of Columbia. And while DeWitt’s basic background is known from the start, there’s more to his story. Uncovering the secrets of his past is just one of the player’s goals. Your main goal is to find Elizabeth, a young woman who's gone missing and return her unharmed. The only problem is that she's being kept on this flying city. Columbia was once a symbol of America's success as a nation, floating around the world as a traveling World's Fair, a marvel of human innovation. That alone certainly evokes echoes of the ideals and commentary that was found in the original bioshock but Irrational Games Creative Director Ken Levine has stressed that the the skybound city of Columbia is indeed a far cry from the watery depths of Rapture. Check out the trailer here and the gameplay video here. Levine has suggested that films such as Stanley Kubrick's horror masterpiece The Shining and David Lynch's surrealist thriller Blue Velvet were inspirations for Bishock Infinite's aesthetic, narratives infused with a potent sense of deep-seated foreboding and dread, but juxtaposed against and masked by a calm, almost antiseptic foreground. There was pretty much no antiseptic to be found in Rapture right? If you didn’t already know, Infinite predates Andrew Ryan's dystopian underwater dungeon by roughly half a century and thus is a prequel of sorts. The cloud of Columbia represents the pioneering late-19th century idea of American exceptionalism, its walls bedecked with red, white, and blue motifs-a patriotic panache cast against blue, cloud-spotted skies, and is a distinct departure from the worn, rusted and leaking walls of the city of Rapture. status quo-enforcing powers that be, and the internationalist Vox Populi. The game may be a prequel in time but there are no narrative connections to the earlier games. As mentioned above, the plot is about how Booker’s goal is to save Elizabeth. The plot features Booker discovering that finding her isn't the hard part," Levine has said "Getting her out of the city is the hard part, because everyone in the city wants a piece of Elizabeth. She's the center of this conflict that's tearing the city apart, and she doesn't even know why." But what of the game’s name? What is the meant by 'Infinite'? Is it a reference to anything. Levine has not been persuaded to give a reason for the word "infinite" in the game's title, teasing only that it has significance. "The name has meaning," he said. Bioshock: Infinite is available for pre-order from Amazon right now .